We missed the 2017-2018 New years Eve Cruise due to a squeal from our Alternator (Here's the article about that) Short version was that we were towed from the Lake Boca Anchorage back to our Dock in Fort Lauderdale. This post will hopefully be helpful for others that have little experience with Boat Diesel Engines, like us, even though we are climbing up that learning curve rapidly. Digital Alternator charging indicator shows charging rate changing rapidly, varying by as much as 30Amps. Alternator Drive pulley too hot to handle. The earlier issues were leading me to suspect the Alternator Regulator. 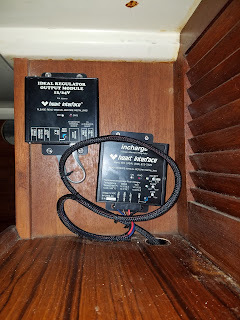 When we purchased Eximius, it had two Regulators mounted in the Aft berth (very close to the engine) Both were by the same manufacturer and until I installed a new Alternator last May (2017) I thought that the smaller of the two Regulators was not connected. During the Alternator install, I found from tracing the wiring, that the Smaller regulator was in fact the one connected to the Alternator. The other is connected to the Digital Battery monitor at the Nav Station, but not to the Alternator. 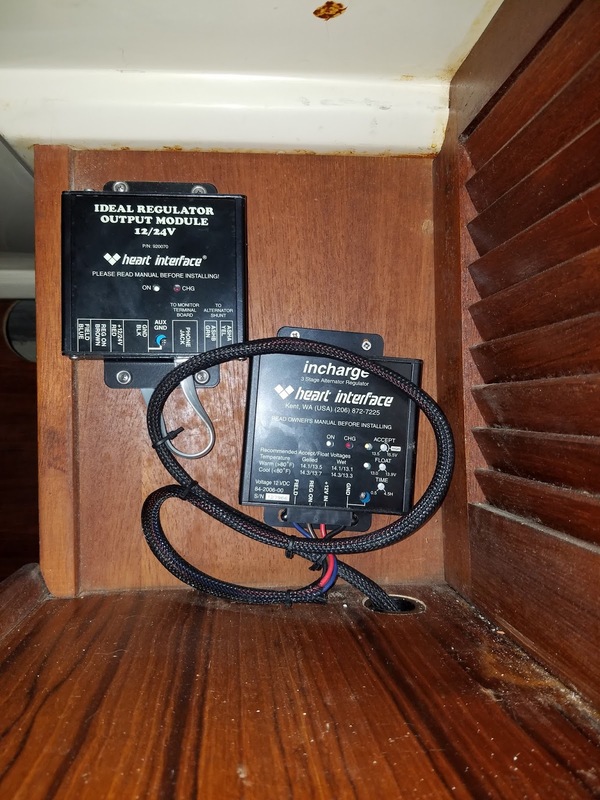 After some research, I discovered that the 2nd Regulator was actually a Stand by in case the main failed, however the Main was never attached to the Alternator so the system has been running off the Standby Alternator since we have owned the boat. Confused yet - think how I had been. The 'Stand By' Regulator is the one on the right, it's not connected to the Digital Battery Monitor but is connected to the Alternator. My guess is that when the system was installed, the installer connected the Stand By Regulator to test it (no point in having a spare if it does not work) but never completed the job and switch over to the Main Regulator. We're hauling out the boat next week and I had planned to re-wire the Alternator to the Main Regulator and thus determine if the Stand By Regulator was causing those first few issues. The more recent issues (Squeal from alternator and hot drive pulley) demanded sooner action, I certainly did not want to have an Alternator problem when we are motoring to the Boat Yard trying to keep on a schedule. Compass Marine, that's where I purchased the CMI 100Amp alternator and they were very confident that the bearings would be fine. When we purchased Eximius, I started to put together spares to carry on the boat, including spare Fuel Filters, Oil Filters, Air Filters, Zinc, and Alternator Belts - I took the info off of the original Belt and purchased two spares, yes, they were on the boat when we had the squeal, but I honestly thought that it was the bearings as the squeal was sooooo loud! But now I found that the belt was not the right size for the Alternator - It had a 1/2" Pulley and the Crankshaft & Coolant Pump pulleys are 13/32"
Ok, it looks like the culprit is the Drive Belt. This Video shows the Balmar 75Amp Alternator being tested. It's not so apparent in the video, but on-site it was obvious that the bearings were squealing. Greg commented that the bearings needed replacement and that the stator might also need replacement. That should be ready for pickup on Monday, we'll carry that unit as a spare. The problem was the Bolt that secures the upper end of the Alternator Support Arm, and the spring/lock washer that was between the bolt head and the Support Arm. 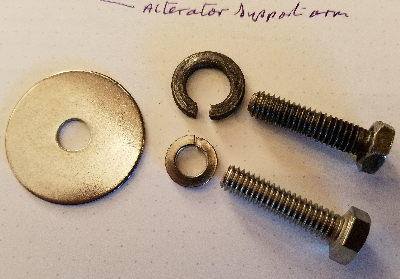 The lock washer had deformed and damaged the bolt head. I decided to replace the bolt, washer and add a fender washer that could be bent over the side of the support arm to lock it in place. Guys from the C34 forum suggested that I use a longer bolt and nylock nut on the back of the bolt to secure it in place and prevent loosening with vibration. The damaged bolt is shown above the new (but same length) bolt. I'll replace the new one with a longer bolt and and Nylock nut next week. After installing the new Bolt, Spring Washer and Fender Washer, I was able to tension the belt sufficient to stop the Squeal, but the belt is still under tensioned! So time to buy/make a belt tensioner. It could be the drive shaft tension!